We all love the feel of a soft, thick and springy carpet under our toes, but for your cat, the temptation to dig their claws in and scratch can be too much! Scratching is a normal healthy activity that all kitties love and need to keep them in tip-top shape but sometimes the places they choose to flex their claws aren’t ideal. So how can you stop your furry pal from carving up the carpet or wrecking that rug? How happy is your cat? 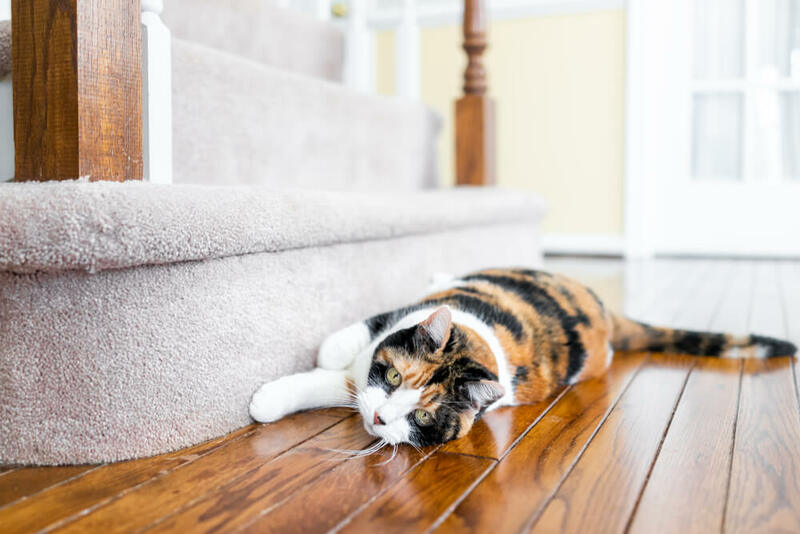 If your carpet’s being subjected to a clawing, or your kitty has started widespread or excessive scratching, it could be a sign that something isn’t quite right. Luckily there are lots of things we can do to help! 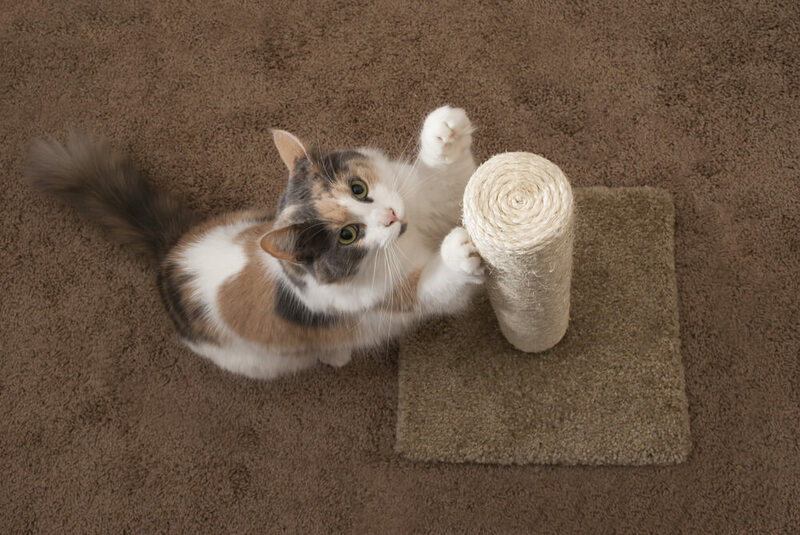 Check that scratching posts are in an accessible location - your cat may just prefer the carpet because it’s easier! Create a fun space. Make time to play with your kitty and provide lots of different toys - a moving toy on a string is sure to be a success! Show them lots of love! We all like to feel loved, so show your kitty how much they mean to you and give them lots of praise, fuss and attention! What makes a purrfect scratching spot? If you want to help you kitty learn where to put their claws, make sure they have a sturdy scratching post to stretch out on. Whether you choose a vertical or horizontal post, make sure your cat can fully stretch out on it, and place it near their favourite spots - such as by their bed. Sometimes it’s hard to break a bad habit without a little help. For your cat, the sight and scent marks from previous scratching creates a tempting reminder to scratch again! To help them move away from inappropriate areas like the carpet or furniture, make sure you clean any marks you find with water and a simple soap to remove the scent. 4. Stop That Rug Wrecking! If your cat has taken a liking to your carpets, don’t worry,- you don’t have to put up with a threadbare, scratched lounge. With a little encouragement, it’s possible to redirect those claws by considering your kitty’s needs and giving them a better place to scratch. If your cat has been scratching for a while, or is particularly destructive, after you’ve cleaned away existing scratch marks, consider using FELIWAY CLASSIC spray on areas you’d like your cat to avoid (so never on their scratching post!). Working to reassure your kitty and help them learn where to scratch, FELIWAY CLASSIC spray can be used alongside FELISCRATCH by FELIWAY (which should be applied to scratching posts), to encourage your cat to feel more at ease and reduce scratching from stress. Helping your cat trim their claws might be another solution. By using the tips above you should soon have a confident, happy cat who knows not to claw the carpets! However, you can always provide a little extra support and security for your kitty with a FELIWAY CLASSIC Diffuser. Working to reduce stress and reassure your cat with reassuring messages, the diffuser adds extra environmental comfort to calm your kitty and reduce any stress-related scratching.